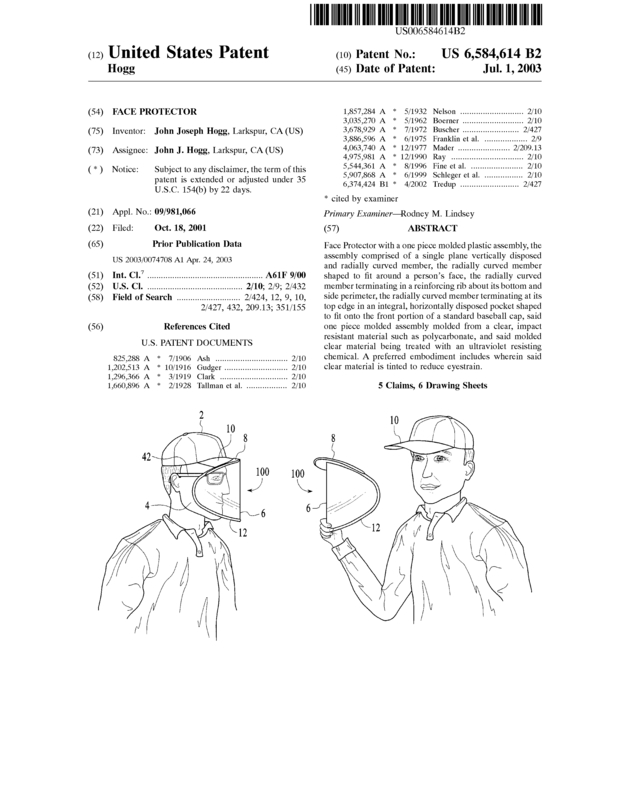 This U.S. patented product is a single piece, plastic molded faceshield that easily attaches to a standard baseball cap. It can be used for protection from the sun's harmful ultraviolet radiation (UV A&B), from flying debris & sprays, or even to help prevent the spread of the flu. Lifeguards, cross-country skiers & snow shoers, wood & metal shop workers, landscapers, roofers, BBQers and others who work and/or play outside would find this product convenient to use and preferable to applying greasy suntan lotion/ zinc oxide to the face all the time. 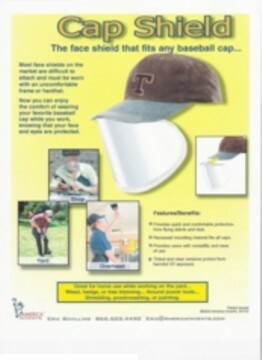 Developed with the help of America Invents of San Francisco, the "capshield" has been marketed before, with some interest from manufacturers of sunshades and other types of face shields. It received serious attention from a multi-billion dollar, east coast holding company (the Danaher Corp.) a while back. As well, the product was a finalist in a recent product search sponsored by Everyday Edisons (PBS) for Bed, Bath & Beyond. The capshield is simple to produce, easy to store (you can store about 100 units in a cubic foot), inexpensive to ship (very lightweight), and has a very good, potential profit margin. We are still looking for a suitable company/entrepreneur and/or plastics manufacturer that does injection molding of polycarbonate and a distributor. License/ Sale terms are negotiable. If you have any questions, please feel free to respond to this posting, or you can call me personally via phone. Page created at 2019-04-21 19:02:51, Patent Auction Time.